Summer essentials: swimsuit, sunscreen and a stitching project. Whether you're planning on heading to the beach, lounging poolside or sipping iced tea in the shade, these ten embroidery patterns are the a great way to keep your hands busy whilst enjoying your summer relaxation. You'll find patterns for shells, creatures, summer fruits and more. They're all ready for your summer stitching! Head to the beach as you stitch up this free pattern from Bird Brain Designs. The bucket of summer sea shells looks so bright and fresh stitched as bluework on a kitchen towel. And of course, it's perfect for anyone who enjoys a bit of sand between their toes! Bird Brain Designs has many more seasonal patterns for summer, so be sure to look around while you're there. This modern pineapple embroidery pattern uses stitches in clever ways to produce a colorful design that screams summer. It would look fantastic on a pillow, and of course, if neon isn't your thing, it could be worked in more traditional pineapple colors. To keep the tropical theme, be sure to check out Naive Needle's flowery flamingo pattern too! What's better than a delicious ice cream cone in the summer? How about six delicious ice cream cones in a rainbow of flavors! This free ice cream mandala pattern has a nice repetition to it, and will remind you of your childhood summers. Stitch it with your favorite flavors, er, colors! What activity is more summer than eating lunch out of a basket in the sunshine? This DIY project from Lovely Indeed starts with a basic blanket and then adds giant embroidery to turn it into a picnic blanket that's perfect for summer. The "let's picnic!" lettering is fun, and is only the start of what you could do with this project. Add extra designs, change up the phrase or both! If you live in a region where there are fireflies, you probably know that summer is here when you first see these glowing insects appearing at night. This is the inspiration for Little Dorrit & Co.'s free Summer Nights embroidery pattern. It's a good pattern for new stitchers, while those who are ready to tackle specialty threads may want to try glow-in-the-dark floss for the fireflies. Summer wouldn't be summer without the sun, but this stunning pattern from Lolli & Grace allows you to have the sun any time of the year. 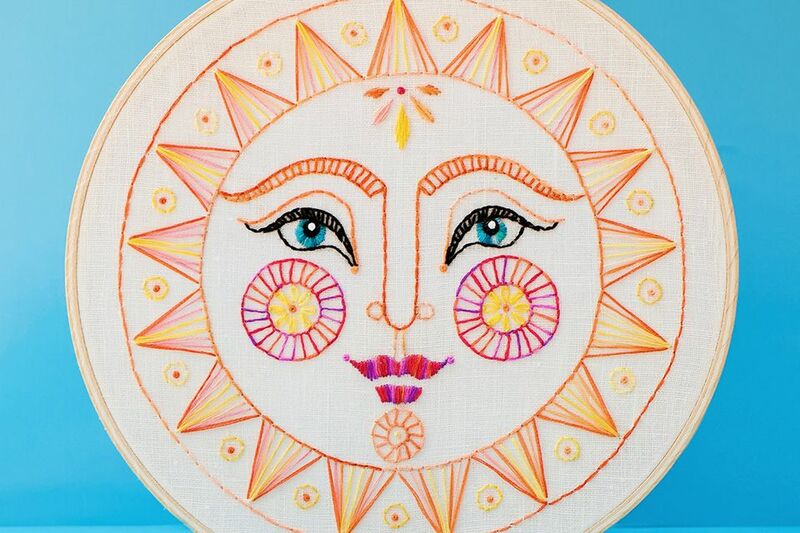 Let the Sun Shine is a pattern with lots of details, but they are worked with simple stitches so anyone can create a smiling sun! Stitching tiny sizes is super cute, and it's also instantly rewarding because it goes so fast. These miniature summer embroidery patterns fulfill both of those things, and they're even cuter when framed in tiny fancy frames! Bev from Flamingo Toes provides the free patterns and a how-to for easily framing your finished embroidery. This beautiful seahorse embroidery kit features a design that's reminiscent of vintage nature illustrations. The wonderfully detailed pattern comes pre-printed on linen, with a choice of colors. All you have to do is stitch! However, if you want to transfer the pattern onto your own fabric, a PDF version is available too. If summers at the seaside are just your style, take a look at the I Heart Stitch Art's Conch, Crab and Octopus patterns. Embroidery on gingham, which is often called "chicken scratch," looks a bit like a combination of cross stitch and blackwork. Because gingham brings to mind picnic cloths, pairing it with a watermelon design make this a project you'll want on your summer table. Mary Corbet shows how to achieve this watermelon gingham embroidery over at DMC's blog. Gardens are in full bloom when summer hits, and this pattern celebrates that fact. Floresita from Feeling Stitchy shares this free summer flower pattern, which she shows stitched in every color of DMC's Coloris embroidery floss. You'll most likely choose to work this in another palette, but no matter the colors, this pattern is attention grabbing!